Last summer, my son wanted to create a list of things he hoped to accomplish during the summer. We had a long list of about 50 things, and I'm happy to say we did quite a bit. 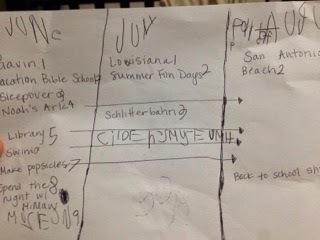 We are inching closer to another fun summer, so he already asked to create his list. When we do an activity, we just cross it off and look forward to the next one! He LOVES to cross off an item and see what's next! 2015 Bucket List (in progress) - by month :) His choice! So grab your littles and make a summer plan! We only had a few big items on our list as these are items that may take quite a bit of planning on your part. We spaced these out so we could get really excited about our plans. We also made sure to do them on weekends so daddy could join in the fun (and help the frazzled, planning mommy!). Check your area for fun family activities -like the beach or maybe even a local camping spot - and see how you can incorporate these great places. For a small entrance fee, you can have access to a great area for splashing in the water! Pack a lunch or grab pizza and snacks at their concession stand. I'd say this place is one of my son's all time favorites. There's also a large pool and slide if your kids are strong swimmers. Lifeguards are always on duty! This museum can get crowded, and the parking is a bit crazy, but we do try and go once during the summer. If you have little ones, there's a great toddler area upstairs. And the waterworks outside are always a hit! Check out their summer schedule as they have movies and plays for free! Pack a late dinner and find a spot on the hill - always a good time if you don't mind a late summer night! We have enjoyed every visit to this small, but fun, museum in the Woodlands. There's an activity for every age - from magic shows, a pretend grocery store, dress-up, big building blocks, to a small play area for your toddler. It's a must on our list! We are itching to get back to Constellation field. The Skeeters games are AH-MAZING for the kids and adult kids too! You can purchase a seat or purchase some spots out in the field where you can bring a blanket! Don't forget your swimsuit - there's a splash pad and a pool too! And if the kids get antsy, take them to play on the playground, too! Located in downtown Houston, Discovery Green is a great place for your kids to run free! Splash pads, playgrounds, and big hill for climbing and running - make it extra special and stop by before or after an Astros game! Many food vendors are around the green as well. Pack a picnic for a fun trip to the zoo. The new gorilla exhibit is now open, and it's fantastic. 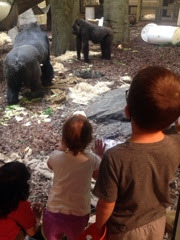 My gorilla-loving son enjoyed opening day and having a gorilla talk with one of the zoo keepers. I highly recommend a membership too - many perks and great events throughout the year. If you don't mind a late summer night, you can bring your favorite snacks and/or dinner to Hockley and enjoy the show! Tickets are reasonable, but get there early to grab a good spot. Movies will not start until after dark, so you will have a later night. No problem - bring the kids' pajamas and let them snooze on the way home! Great concession stand too! If your child is able, have him/her write his own list. 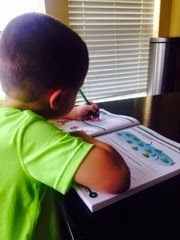 Since we started kindergarten this last year, and he's learned quite a bit, we are making sure to stay focused on all the new things he's learned. I bought this book from a friend's recommendation, and we plan to work our way through it by summer's end! He's so excited that we've already started it! He's determined. Or, you could hit the library a few times and mark that one off your list. Choose some great books to take home too - another fun bucket list item! Kids love the little things - especially all the things that make summer so memorable. On our list, we included eating popsicles (or make your own! ), have a family movie night, catch love bugs, swim, run in the sprinklers, have a picnic - you could think of a bunch! One item he is thrilled about is having a friend spend the night - his first real sleepover! He's already talking daddy into pitching a tent and making it a mini-camp out (bless Daddy if he convinces him!). We are starting off on the last day of school with a pool party. I can't wait to make these for our guests! I'd love to hear your ideas. 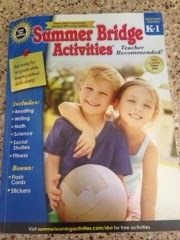 Summer is coming, and it doesn't have to be boring - get your child involved and make some fun plans. Big or little, your kids will create great memories!